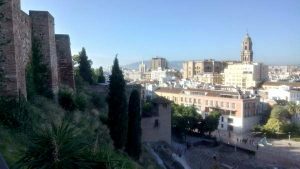 Blink and you might miss it, but the Alcazaba walkway and viewing platform are worth seeking out when you’re in Malaga. Easy to find, they give you very different views of the city and a premium bird’s eye vista of the Roman Theatre and Calle Alcazabilla. 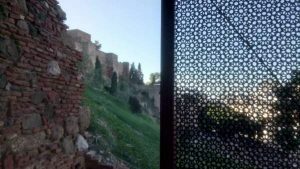 The Alcazaba walkway and viewing platform have been built to allow public access to the space between Calle Alcazabilla and the Alcazaba Fortress itself. Built in stone and iron, the walkway zigzags up the foothill to a stairway that climbs up to the first circle of walls of the Alcazaba. It reaches as far as one of the entrances (complete with portcullis) of the Alcazaba, but doesn’t have access to the monument itself. The construction blends perfectly into the landscape and unless you look carefully, it’s difficult to spot. We like the iron-work on the stairway that imitates the Moorish mosaics in the Alcazaba Fortress. The surroundings have been tastefully landscaped and covered in thyme plants – the scent in spring will be amazing. The Alcazaba walkway runs between the tunnel and the Roman Theatre along the foothill of the Alcazaba Fortress. 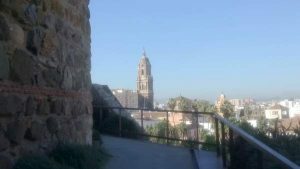 You can access the Alcazaba walkway from either of the two entrances. One is located on Calle Alcazabilla between the Roman Theatre visitors centre and the Albeniz Cinema. Look out for the alleyway between the two. The other entrance is on Calle Mundos Nuevos off Calle Victoria – take the first right as you enter Calle Victoria from Plaza de la Merced. You can see the exact locations on the map below. This isn’t one of the biggest attractions in Malaga or one of the most interesting. But the Alcazaba walkway gives you a very different vista of the city. It’s easy and quick to visit, and is free. Views of the three towers – the Cathedral tower, San Agustin tower and Picasso Museum tower – fronted by the very tall palms in Calle Alcazabilla. Views beyond the Alcazaba Fortress south to the sea with the ferris wheel and industrial chimneys in the background. The bird’s eye view of the Roman Theatre that gives you an excellent perspective of this monument and an idea of its structure. The early morning sunshine in the winter. While the Alcazaba Fortress is shrouded in shadow, the city centre is bathed in sunshine. The last of the light in the summer. Time your visit to coincide with the last of the day’s light in September as the sun sets over the city centre. Opening hours: daily October to May 10am to 5pm; June to September 10am-8pm. Last entry 30 minutes before closing time. Accessible: No. the entrance on Calle Mundos Nuevos has a ramp and access via a slope but you soon hit the stairs. There are about 40 steps to reach the top. Time to allow for visit: allow at least 30 minutes for your visit. Longer if you sit down to really take in the views. This is one of the newest attractions in Malaga. To keep your finger on the Malaga buzzer – sign up for our free fortnightly newsletter. All you need to know about what’s on and what’s new in the city in your inbox every other Friday.